One of my friends moved back to Pittsburgh a few months ago, and had us over to her apartment over the weekend for a girls night. 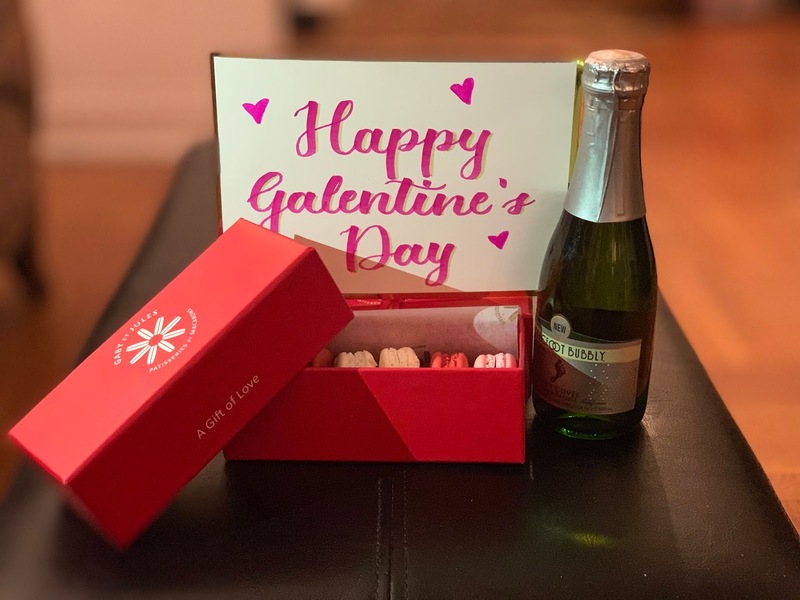 Since we were so close to Valentine's Day, I thought it would be cute to turn it into a little bit of a Galentine's celebration. In my mind, there's no better way to celebrate that (or really, any holiday!) with some macarons and a little bit of bubbly. Plus, my sister hand-lettered these Galentine's Day cards - aren't they the prettiest?! The macarons are from my absolute favorite French bakery in Pittsburgh, Gaby et Jules. I think they make the best macarons in the city, and always have a great selection of flavors. They also make some incredible French desserts - their Opera cake is equal parts beautiful and delicious. I know that Galentine's Day is a super trendy thing to do right now (it's very Instagrammable!) but I actually really love the idea of celebrating friendships around Valentine's Day. Maybe I'm saying this because I'm single and so my friendships ARE the relationship in my life, but I don't think that's it. I've always really cared about my friendships, and as I get older, I've only started caring more. I think it's so important to surround yourself with quality friends - friends who will be there for you and support you. This has been a big year for me, and it's meant a lot to have friends by my side, either virtually or in person, to cheer me on and encourage my the whole way. We hear so much about female friends being competitive and passive aggressive, but I haven't found that to be the case at all. My friends have been the opposite - always cheering on my successes, not trying to one-up them. We put a lot of emphasis on celebrating the romantic relationships in our lives, but often, it's our friends who are some of our longest relationships! I love the idea of taking Galentine's Day to celebrate the love of our friends, and to tell them how important they are. I really think that's important in a friendship - to recognize and appreciate your friends. So if we need to create an Instagram holiday to make that popular, I'm all in.